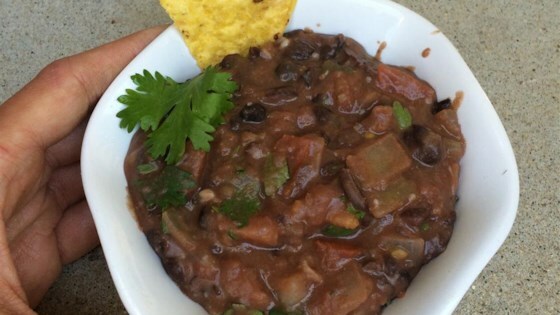 "This black bean dip is great served with corn or flour tortilla chips. Serve warm or at room temperature." Place black beans in a medium size mixing bowl, partially mash beans -- beans should remain a little chunky. In a medium size frying pan, heat oil over a medium heat. Stir in onion and garlic and saute for 4 minutes. Mix beans, corn, tomato, picante sauce, cumin, and chili powder into the frying pan; cook for 5 minutes or until thickened. Remove the pan from the heat, mix in cheese, cilantro and lime juice; stir until cheese is melted. Quick and hearty dish for any meal of the day. Easy to prepare and a nice taste. I used 1 Cup of med. salsa instead of the picante sauce and tomatoes. I also used cheese with jalapenos for more kick! This is so good. I used Southwestern Black Beans and Hot Pepper Cheese. It was so good that it was hard to put away but I had to, this recipe makes so much. This is the best bean dip recipe I have found. Best if served and eaten while still warm.